Several years ago, Mummy and I decided that we wanted to take a trip to the USA - let's call it an American Dream. And, because we haven't been yet, but I keep going on about it, Mummy has decided I should write about it. It being the trip. That we haven't taken. Mummy, of course, had already been to the USA, having visited Boston and New York. But that was 16 years ago, and on a school trip. School trips for me seemed to consist of Canal Museums and Monuments, neither of which were particularly memorable or really more than half-hour away by coach. As a family we've taken short holidays across Europe now, to destinations as diverse as Switzerland, France, Greece and Italy, but I've still never been to the States. In fact, Mummy will delight in telling you that I never got in a "big" aeroplane until we got married and set off to Greece on honeymoon. I think my first words on the plane, as it sped down the runway at London-Luton were "woah, it goes pretty fast doesn't it!?". On the flip-side, I did get the amazing fortune to take a business trip to Chile in South America last November, a journey of about 22 hours, on a "really big" plane. We stopped off in Brazil too (I saw the inside of Sao Paulo airport, which isn't really a claim to having "visited" Brazil but it's good enough for me). So, back to this planned USA trip. There is something about the USA that I want to see. I don't know if it's because it's so big, so far away, or just because they speak English there. It might be because, from what I read online, each state in it's own way is like a little country - heck some (or more) of them are bigger than the UK anyway. Is it that they have everything from Forests to Deserts to Mountains to Sea Coasts to... well, I can't put my finger on whatever it is, but I sure want to go. Although, I do know I want to walk down tree-lined avenues in the glorious colours of autumn. And see boulders. And towns that have the same names as towns in the UK. And ride a Harley Davidson from "Boulder to Bullfrog on the Burr Trail in Utah" (because a blog I once read told me I wanted to - I have only ever ridden a moped. Badly). So we bought a book. 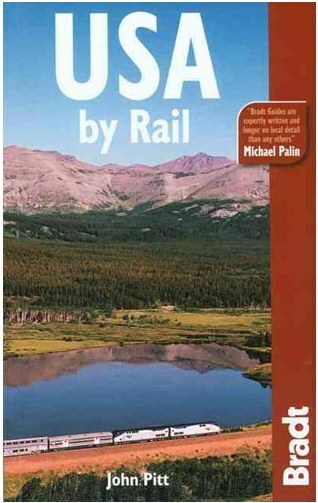 It's called USA By Rail, and it came highly recommended.. by a reviewer on Amazon. Possibly the Author. And at the time, this was the planned trip. 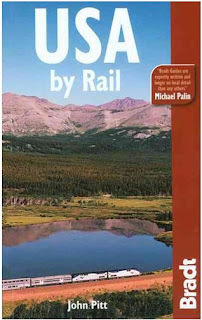 We would fly to the Eastern coast of the USA, and pick up the train. We'd travel, where possible, by night, stopping in major cities in about a dozen US states, ending up two or three weeks later on the West coast, where we'd fly home. At the time, the cost of the all-access train pass for European visitors was under £450 for a month's unlimited travel - the only thing we'd have to pay extra for was food and hotel accommodation on the nights we weren't on the train. Oh, and flights. And upgrades to sleeping accommodation if we wanted to actually get some kip. And tips. And souvenirs. And entrance to attractions. Well, you get the idea. But! Which states to visit? Where to start, and end? What attractions to take in? How much were motels? Who had the prettiest leaves, and what time of year would they still be on the trees? Are American McChicken Sandwiches kidney shaped like in the UK, or round like they were in Greece? 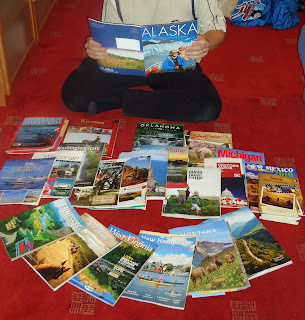 Time for some serious research.. on to the Internet, and off to the Tourism websites for every US state. And, it turns out, every US state regularly produces a glossy tourist information brochure. And, about 25 of the states will actually post it to you, in the UK, free of charge, along with state maps, colouring books for the kids, and even DVD's showing you the best time to visit for "foliage". As a result of that initial request, I appear to have joined perpetual mailing lists. Thus, the 2010/11 magazines have landed, hence the timely publication of this post. Sadly, financially, we can't really afford a trip to the USA any time soon, but I will gladly admit to wiling away hour after hour, reading the magazines from cover to cover. Changing at a moments notice my "favourite" state, normally based on something as ludicrous as who has the prettiest Governor photo montage of trees, or where you can ride the "world's largest flume ride". And, next week whilst I am camping with Top Ender in Devon, I will promise her again that one day we will go on that trip, and in the meantime, yes you can cut the pretty pictures out of these glossy brochures. Except that one, you can't spoil a flume ride picture like that! *It was Alaska. We're not going to Alaska! Making Bath Time MORE Fun! Go! Go! Go! and see this show!